How many people have you funded out of Uganda? As of 03/02/2019, we have supported Ugandan conductors to help 1,935 individuals to escape from Uganda: 1,921 LGBTQ adults, six straight allies, and eight children. We know that at least 193 adults assisted identify as transgender. Roughly an equal number of cis-male and cis-female (i.e. not transgender) people make up the rest of the passengers. At least 13 people have identified as bisexual. There are almost always more passengers that are in hiding, on the Ugandan conductors waiting lists for funds to get them out. Please donate to support them! I am a [LGBTQ] person. Will you please help me to get out of Uganda?! 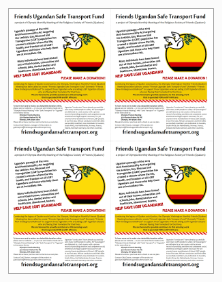 Friends Ugandan Safe Transport Fund doesn’t respond to individual requests for funding or assistance. We do not make decisions about who is helped, how and when. We – based here in Olympia, Washington – do nothing on the ground in Uganda; all the real work is being done by Africans for Africans – by the people we call the conductors. LGBTQ people find them on their own by word of mouth. We can’t tell you how because we don’t know. They choose who goes, when they go and in what order, the routes utilized, the interim destination, the choice of way-stations, transportation, and lodging. Each of them works with other organizations (NOT us) and individuals who provide housing, food, medical, psychosocial, legal, and visa services. They are responsible for ensuring that the people in their care are delivered to a SAFE place. Also, we cannot connect you with these leaders for their own security, as we know that there are people seeking them to do them harm because of this work they do. They are putting their own lives and welfare at great risk to help others and we will not disclose their identity. They work independently, so some of them do not know the others and that is for all their protection. Our role is very limited. For security reasons, we never forward any referrals to the conductors. We hope you are able to find the help you need. I hear there are a lot of scammers out there who are using this situation to rip off well-meaning people. Aren’t you falling victim to that? We understand the problem with being scammed. We don’t send funds to individuals who contact us directly asking for money. We only work with and through local activists who are known to us. For example, we ‘vetted’ [name] and [organization in Uganda]. We read the article about him when he was in [another country] as a refugee, we have connected with others who work with him, and have copies of photos of him in the hospital when he was assaulted, and of receipts for hospital care we helped pay for. Note, identifying information has been removed to protect those in the field. Other people we are working with on the ground in Uganda are known as reliable and trustworthy to people here who work with them on other issues. They are keeping their names out of this work because the straight allies they are connected to are putting their own lives at risk and the lives of the ‘conductors’ who are helping get LGBTQ people out of Uganda. 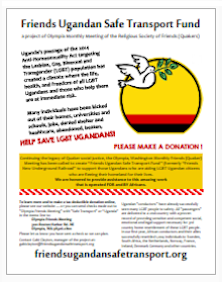 Are you just relocating LGBTQ Ugandans out of Uganda with no provision being made for them once they arrive in their new home? What then? Homophobia and transphobia in Africa are not limited to Uganda. You leave them on their own? Shouldn’t you wait until you have a whole plan for them? We share your concern. However, the people the Ugandan leaders are working with are ones who feel that the risk of staying there now — with this worsened dangerous situation — means they need to get out first and then work on the rest. We trust that the people they are assisting know what they need. We are clear that our mission is to assist in the first step of getting LGBTQ people out of Uganda, and the limitations on what we and the leaders who work with us are able to provide. They have connections with folks in Kenya and other countries who are assisting with visas etc. We do not take on that role ourselves. And by the way, none of the people they are assisting out of Uganda are winding up in the horrid refugee camps in Kenya. Aren’t you jumping in without knowing what you are doing? We are figuring it out as we go (what program doesn’t?) but our core group in Olympia are seasoned grassroots organizers with decades of experience as activists. We did not go into this work lightly and our Meeting didn’t either. We are quite aware that there is a history of some larger non-profit organizations opposing or being critical of grassroots organizing which is what we are involved in. And we know we have been accused of being “amateurs” – and as we are seasoned activists, we take that as meaning that we are not paid, which is true. We are not doing this for money, we are doing this because we feel that something has to be done and we are in a position to do that. This is sacred work to us. We are called to help mitigate the sorrow this situation in Uganda has caused by hearing it and participating and hopefully alleviating some of it. It is important to remember that this work is managed and handled totally by the Ugandan leaders. This is Ugandan people helping Ugandan people. We are doing what we can to support them. Not every Ugandan wants to flee. Some want to stay and fight for their right to be Ugandan and queer. Why don’t you help the work to defeat the systems the of oppression we face rather than help us run away? And will you raise money to support the other parts of this work – to ensure that every LGBTQ person arrested can get legal defense, to advocate for access to health for our communities, etc.? We absolutely support those who are deciding to stay and fight for their right to be Ugandan and queer. We understand the passion for that because it is so very important. “… At the same time, as the mother of Bill, a son who at 17 was assaulted on the basis of his sexual orientation 19 years ago, who committed suicide a month later because despite being completely loved and celebrated by his family and many friends, believed that he was doomed to live in a world that would always hate him — and held in trauma beyond the help we were able to get for him, chose death and committed suicide on May 8, 1995. And so my concern is also very much for those living in such pain and fear that feel they must flee to build a life for themselves. I don’t think this is the complete answer by any means, but it is part of one.” ~ Gabi Clayton, co-manager of Friends Ugandan Safe Transport Fund, Olympia, WA. We are a small project with a very specific focus on assisting those who feel in this situation that they must leave Uganda. We don’t have the resources to also raise funds for other groups, but we may be able to share some of that information with others as we build our connection with people through this website and our eNews mailing list. So we give in to the homophobic bullies and ship out all lgbts from Uganda? Hey the homophobes win! I bet they`re busy cheering! It’s not a win. This is work we would prefer not to do. We are doing it because we were asked to by people who had direct threats on their lives. Names were read out over radio stations, with broadcasts calling for their arrests, imprisonment, castration, and sterilization. They have been many incitements to mob violence. People have been burned out of their homes (and burned themselves), thrown out of their jobs, expelled from schools. Hospitals are refusing to treat LGBTQ individuals. “Surviving is resistance!” ~ Talcott Broadhead. It is not a win. It is not an answer. It is what we can do. Why did you change your name from Friends New Underground Railroad to Friends Ugandan Safe Transport Fund? Once we began this work we were made aware that among African-Americans there was unhappiness with the name “Friends New Underground Railroad,” which we were told is seen by many as a sacred name for an important part of African-American history – that had been appropriated unthinkingly by Olympia Friends Meeting as a group of European-Americans for our project in East Africa. It took us some time. We met and discussed the objection and our own feelings about it. We acknowledged that we had used the term deliberately to proudly reclaim an important part of our Quaker history of involvement in the original underground railroad. But it is more complex than that, and out of respect to the African-American people who had expressed their serious discomfort, we took the issue under serious consideration. We held a Special Called Meeting of our members and attenders, and then some members of our Meeting met in person with one of the people who had written us. We realized that the last thing we wanted was for the name of this work we are doing to be offensive to people who otherwise supported what we were doing. And we didn’t want to endlessly process the idea of changing the name when there was such critical work to do. So we met amongst ourselves and came up with our new name, Friends Ugandan Safe Transport Fund. And tell others! We need to spread the word to because the more help we get the more we can do. Like our Facebook page and share our posts. Follow us on Twitter and share our tweets. Subscribe to the FNUR eNews and share our posts. Print and share our flyers! We have a full page 8.5″x11″ flyer and our 4-up small flyer both in PDF format in color – but they can be printed in greyscale as well. Help us spread the word! What does a Meeting or a group needs to do to be listed as an official sponsor of FNUR on the website? Write and share a Minute or a letter of support. And let us know – ask to be listed! And donate of course! What will my donation be used for? Will it help Ugandan gay people who are stuck in Kenya now because they were sent there by misguided “refugee” organizations? This project came into existence because of the request of Ugandans themselves and is set up by Africans for Africans. We (Olympia Friends Meeting – Quakers) assist them by raising money to cover the costs of the amazing work they do. Systems are set up by the conductors and those they work with for transportation, medical, psychosocial, housing, food, legal, and visa support for those who choose to leave. Donations that come to the Friends Ugandan Safe Transport Fund cover transportation, food, temporary housing while in transit, and sometimes fees for visas. We have covered some emergency medical costs for two conductors who were assaulted based on their real or perceived sexual orientation and this work they do which made them targets. We do not pay for airfare to new home countries – others cover that and other expenses. The conductors don’t encourage anyone to leave and neither do we. Those who leave usually have very significant threats to the lives and safety. They find the conductors – we do not refer people to them. None of the passengers are in Kampala where the human rights activists seem to be congregated. None of the people helped with funds from us have gone, or will be going, to the refugee camps in Kenya. We are not able to assist LGBTQ people who are in the camps. We are a small project with a limited focus and limited funds. What is the accountability for funds? On our end – as a project of the Olympia Monthly Meeting – there is oversight by Members of the Meeting including our Treasurer and others. The oversight/accountability for funds we send to the conductors is done by us asking for and receiving receipts for things they have paid for such as transport, temporary lodging, etc. along with names of the passengers once they are out of Uganda. We have been in touch with some of them as they ask for letters to help with their immigration status. Also, some of them are sending their stories and we share them on our blog, eNews list, Facebook and Twitter. How much of money donated is taken out for administrative costs? Nothing taken out for administration by Olympia Friends Meeting or any person. There is no rake off. We do take out for postage and printing for mailings to our donors but some of that expense has also been donated. Checks have nothing taken out of them. There is a 2.9% (or less) + .30 cent per transaction fee taken out by PayPal when it is used. Diane Dicranian, Ministry and Council Rep to NEYM – New England Yearly Meeting (Quakers) and the Vassalboro Quarterly Meeting wrote to David Zarembka, Coordinator of the African Great Lakes Initiative of the Friends Peace Teams for information about the situation in Uganda regarding LGBT people and related to the work of FNUR (Friends New Underground Railroad – before we changed our name to Friends Ugandan Safe Transport Fund) because Diane was interested in asking her Meeting and Quarter and NEYM to support the work of FNUR. Here is David’s reply which we have his and Diane’s permission to publish on the FNUR website including their email addresses. In response to your request about the situation in Uganda against LGBT people, I thought I would give a detailed response which you can circulate as you see fit. For the last few years I have been on a lonely campaign against lynching and vigilante violence in Kenya and other parts of Africa (and as I found out at the FWCC World Gathering in Kenya, also in diverse countries such as Indonesia and Central America). I am sorry that I have been unable to generate much traction in the wealthier countries where this rarely happens, and, when it does, it brings massive media coverage. This is not true in Africa. Let me speak on Kenya which I know best. People are lynched (meaning killed by mobs) daily. About two months ago, a man was lynched about 3 miles from my house for stealing 25 chickens. Recently I was driving through my home town of Lumakanda, and saw some young men beating a man (with maybe 25 onlookers) for supposedly stealing a cell phone from a woman. I stopped and honked my horn until they dropped the man — perhaps I should have gotten out to see if he was OK or needed to be taken to the hospital. I could go on with more examples. The newspapers are filled almost daily with one or more lynching and the chicken-thief in our community did not make the news. Sometimes these are directly at “witches” who are usually elderly people (but not always that old as some are killed in their fifties) — there is usually allegations that people, frequently relatives, want their farms and houses. The worst of these are albinos who are killed for their body parts to be used in witchcraft — the killers can sell the parts for up to $75,000 which is a fortune in this part of the world. It is then only a small step to killing people because of their ethnicity such as happened in the post election violence in Kenya in 2008. In 1994 my daughter, Joy, was in Nairobi where she knew a young man “stoned” to death. In this case, they dropped a large stone on his chest and he died. It is not uncommon for gasoline to be poured on bodies and burned. Unfortunately while the security forces condemn this practice and vow to catch and persecute those involved in these murders (for that is what they are), but nothing ever happens as everyone in the community denies involvement and even of the incidences themselves. I am also dismayed by the fact that the Christian Church, including the Friends Church, has never publicly condemned this practice, although I have brought it to their attention. Uganda, in this respect, is very similar to Kenya — I live only about 70 miles from the border with Uganda. In other words, the violence against LGBT people as reported by the [Friends Ugandan Safe Transport Fund] is rather common. As a peacemaker, I would hope that one of the results of this violence against LGBT people will arouse others to seeing the larger problem. Look at Friends Journal’s Quaker Speak, http://quakerspeak.com/justimore-musombi-gay-kenyan-quaker-pastor/, for videos of a Kenyan Gay Quaker pastor who is now at Earlham School of Religion. Note how his family ousted him and seized his properties. Thus, I have no doubt as to the fact that LGBT people in Uganda are being beaten up, threatened, and even killed in the homophobic atmosphere generated by the the Anti-Homosexuality bill, even if it has been temporarily overturned. When a government condones this kind of hate crime, it gives the people the right and incentive to dish out vigilante justice. I read somewhere that there are 300,000 LGBT people in Uganda. Regardless if this is an under-estimate or over-estimate (I think an under-estimate since many LGBT people are completely in the closet with wives/husbands/children), there are a lot of people who are going to be attacked, particularly young people. Moreover every year there will be new LGBT young people realizing their sexuality. So will FNUR is rightly proud of the fact that they have helped almost 500 people to escape, this is only the tip of the iceberg. As Coordinator of the African Great Lakes Initiative, living in Kenya with my wife, I am too well informed about the violence in East and Central Africa, I am well aware that people vary in their willingness to live with potential violence or flee and become refugees or internally displaced people. Either choice is one of uncertainty and fear of the unknown. We who live a comfortable life without fear are obligated by the Friends Peace Testimony to do whatever we can to respond to this violent situation. If we help even one person to escape persecution, we have found God in that individual. Sure we will be criticized by others for various reasons, but has not that been the situation in the history of the Friends Peace Testimony? I think this answers your question, but if you have more, please feel free to contact me.